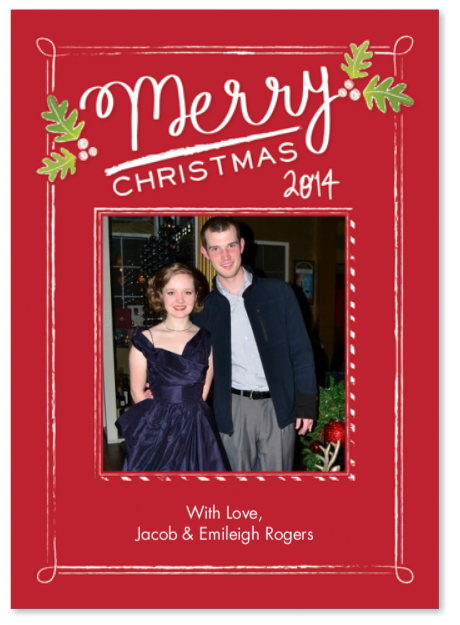 So I am a slacker newlywed and I decided to forego the actually-printed Christmas cards to mail out this year. Quite honestly, I don't particularly like life logistics (those detaily things like paying bills, renewing license plates, you know, all those things you have to remember to keep adult life going), and I didn't feel like adding another task in. Slacker, I know. 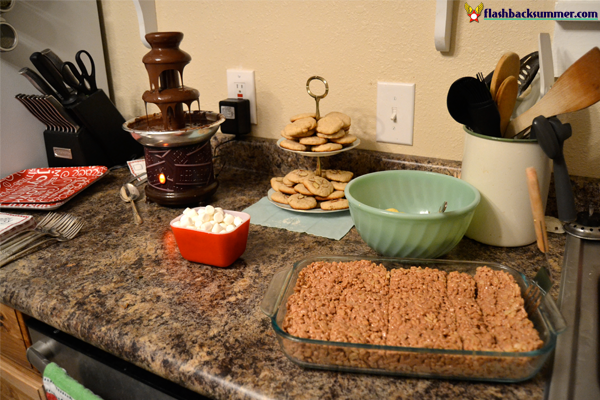 I'm going to make this blog post short so you can go make memories in "real life" off the blogosphere right now! 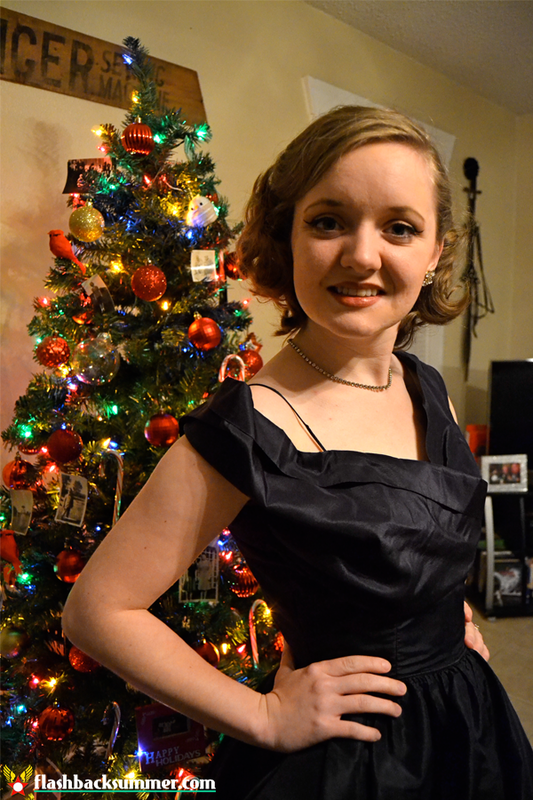 :) Merry Christmas everyone! I'll see you in January! 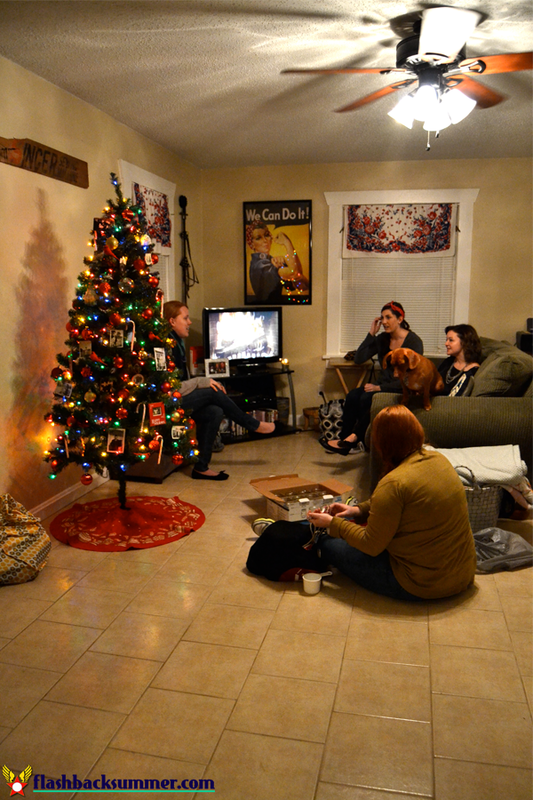 Jacob and I have decided that we want to be the annual Christmas party type of people, so I started small this year and held a Christmas crafting party for a few friends. We all worked on our Christmas gift projects we had yet to finish while eating delicious food and enjoying each other's company! And in case you would like some more Christmas inspiration for future use, I've included information on where I got some of the ideas for food and decor and such. 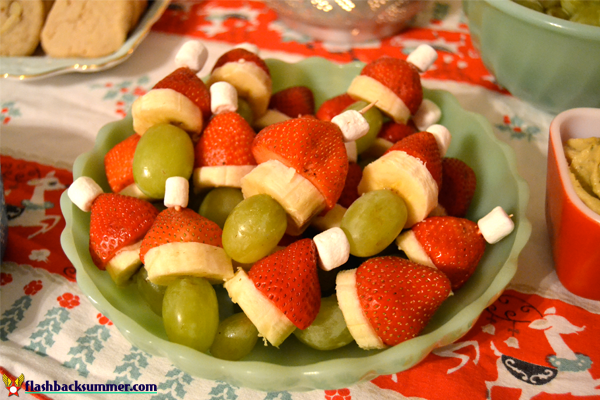 Do you have any tried and true Christmas ideas? Anything that has been a big hit this holiday season that others should know about? 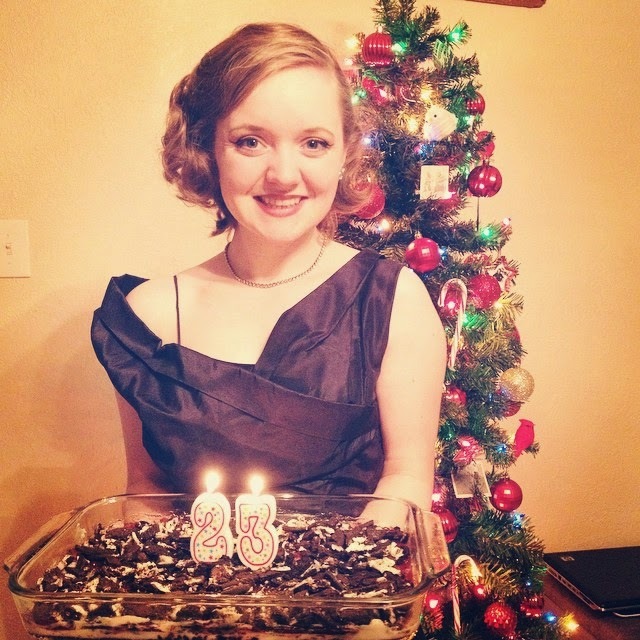 December 17 was my 23rd birthday, and it was fantastic! My husband planned a dinner at a nice restaurant, and my family is in town from Egypt for meetings and a visit! It was a lot of fun to spend time with all of them, all in the same place. 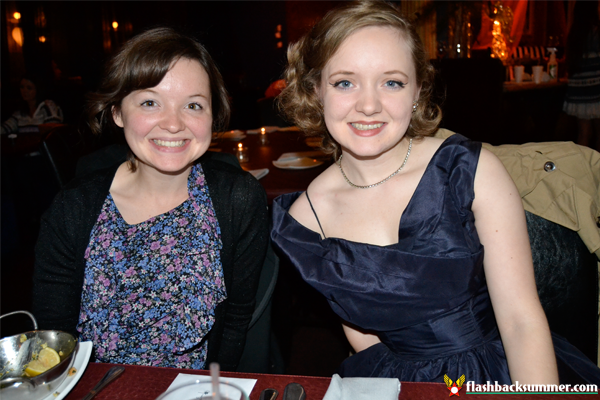 We went to a fancy restaurant in Springfield called Touch. The food is delicious, and it's nice to be in the midwest because even fancy restaurant owners realize we won't put up with those silly tiny portions often found in high-end eateries. The food was, therefore, delicious and plentiful! The ambience was lovely, too, but the dim lighting made it a bit tricky to get good pictures. 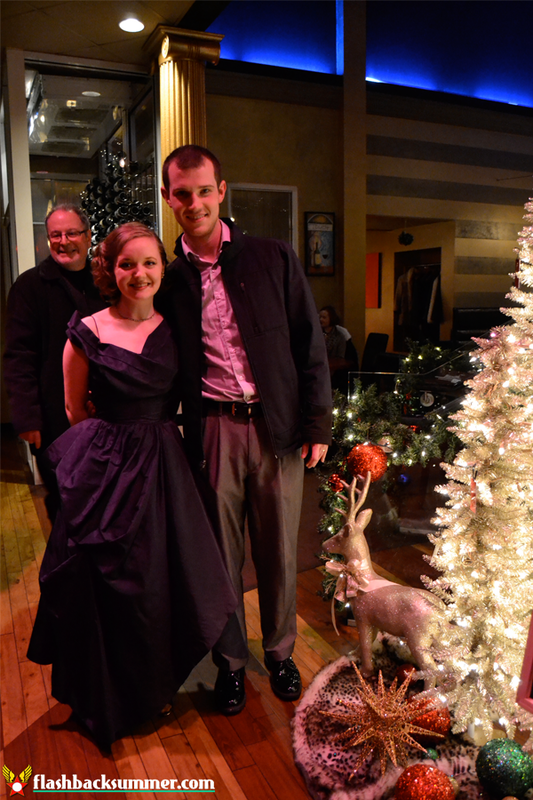 The ones in this post are a compilation of ones taken at the restaurant and in front of our Christmas tree at home. 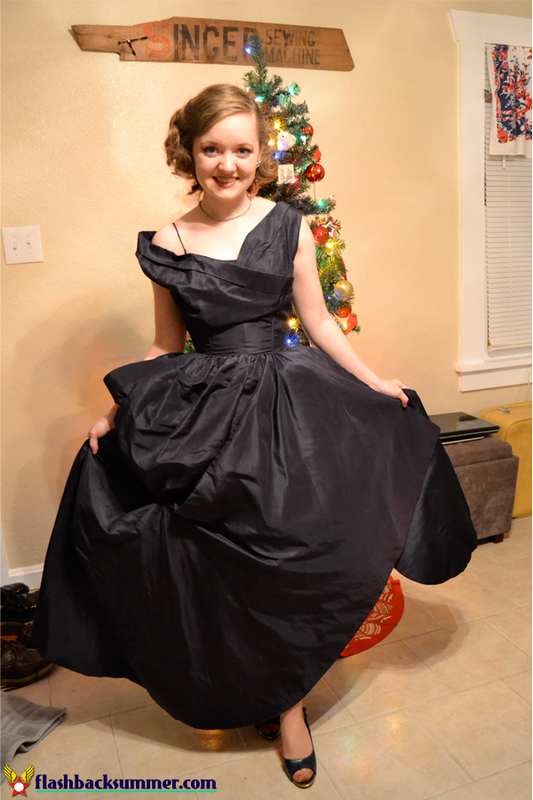 I really just wanted an opportunity to wear this 1950s possibly couture dress I recently acquired in a trade. I've had to repair it several times, but I just can't get over the gorgeous lines! The neckline, the way the skirt is draped, it's just gorgeous! I've determined I will recreate it one day so I don't have to worry about tearing it or anything. Someday. My 22nd year was all about giant life transitions, and my guess is that year 23 will be similar. I'm excited about it. Jacob and I have a lot of plans and aspirations, and we're looking forward to accomplishing them! Bring it on, year 23! 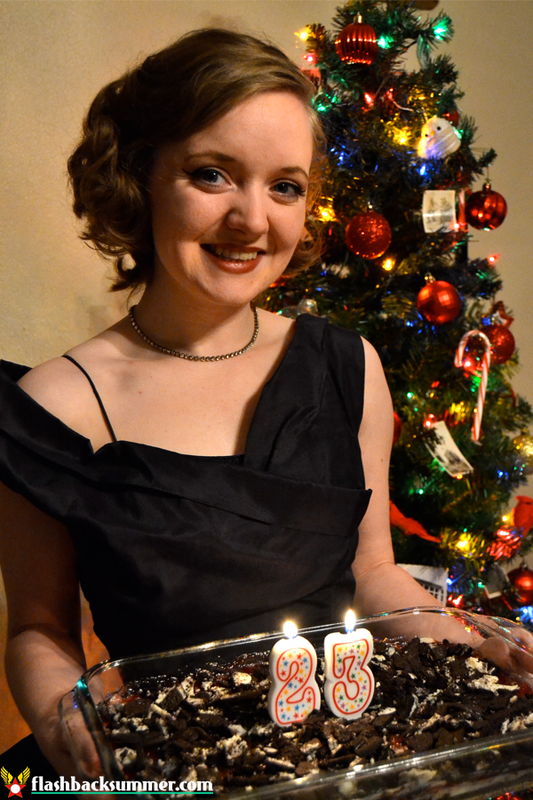 Today is my birthday, so... a post about me! Ha, so humble, huh? I still hesitate to call myself a "blogger" like the title suggests; I usually identify myself as a "person who has a blog," as if the official title of "blogger" was too big, too successful for me. However, I'm coming to realize that I AM a blogger, dangit! 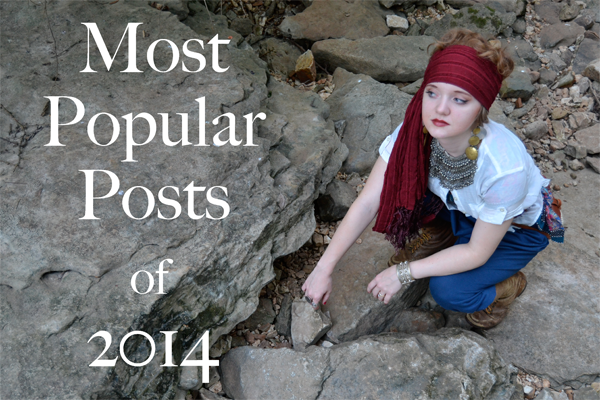 I've put in a lot of work over the past couple years, and I'm going to call myself a blogger! That being said, I've also hesitated to share blogging tips or talk about the act of blogging because I figured, who am I to write about this? I'm working a day job. I'm not a "pro" blogger making a bunch of money off my blog. But, revelation two, I HAVE learned a lot along the way, things that others can find useful in their own journeys. I have knowledge to share! When Jessica posted her 11 questions and answers about her life as a blogger that she found from Bonita of Lavender & Twill, I knew I'd take up her invitation to answer these questions for myself. Because I. Am. A. Blogger. 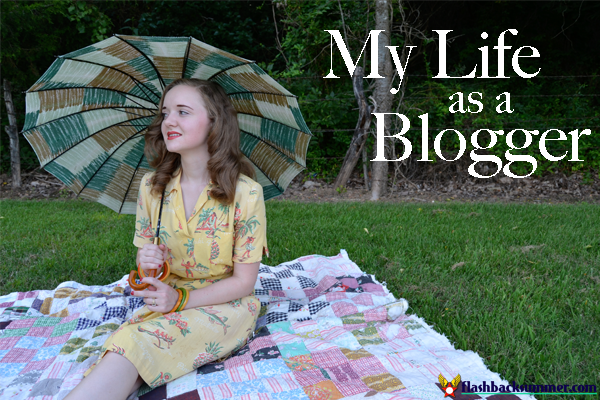 I had previously attempted to start a vintage blog in late 2010, and it was an epic fail. 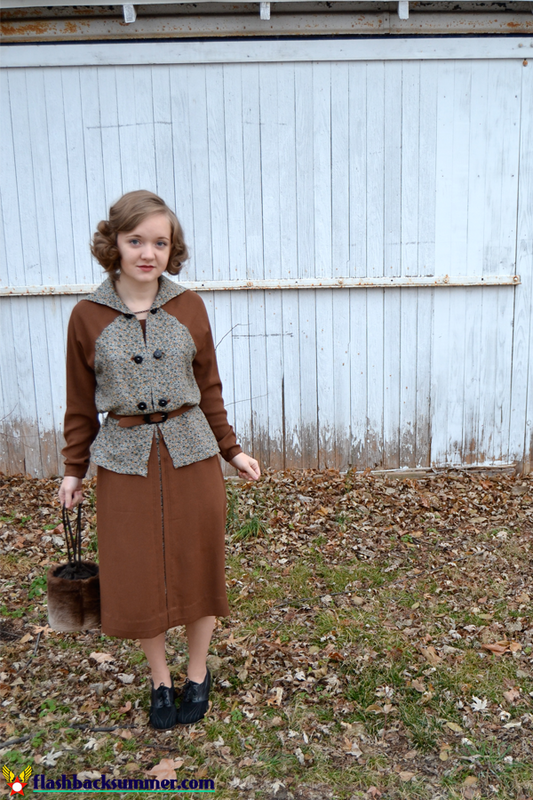 I was pretty much trying to copy more famous vintage blogs... with a beginner vintage wearer's closet. Obviously, impossible. What I learned from that epic fail: Be yourself when you blog. It works better. As I mentioned earlier, I was very serious about my blog from day one. I knew I wanted friends and some pocket change to buy more vintage, so I was very intentional from the start in meeting those ends. I commented on others' posts and got involved in the community. Soon I knew who people were talking about when they dropped names of other bloggers, and I found kindred spirits to be inspired by! My first post was "And So It Begins..." on 14 October 2014. Oh first posts. I've learned so much since then! At that point I wasn't wearing vintage every day and still very new to it, so I hadn't found my "niche," and I was honest about the cluelessness! I've found the temptation to compare and looking for my blog's "niche" to be the most difficult challenges. Especially before I really knew what my blog was, what it's "niche" would be, it was really easy to compare to bloggers who seemed to have it all together, who had a cohesive look and fancy outfits I couldn't afford. 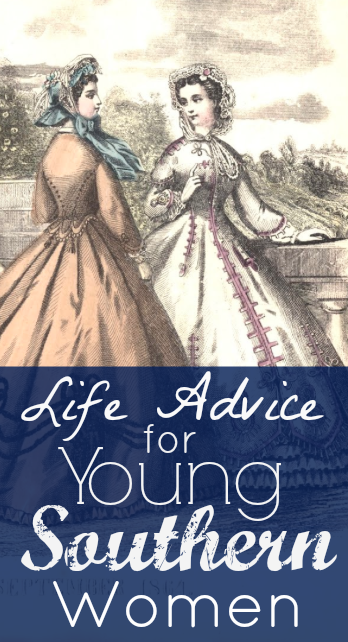 I kept reminding myself that I was new to vintage and blogging, and I was on a journey. I couldn't expect to jump ahead to a five-year bloggers expertise level right off; I was just starting! This is where I blog. 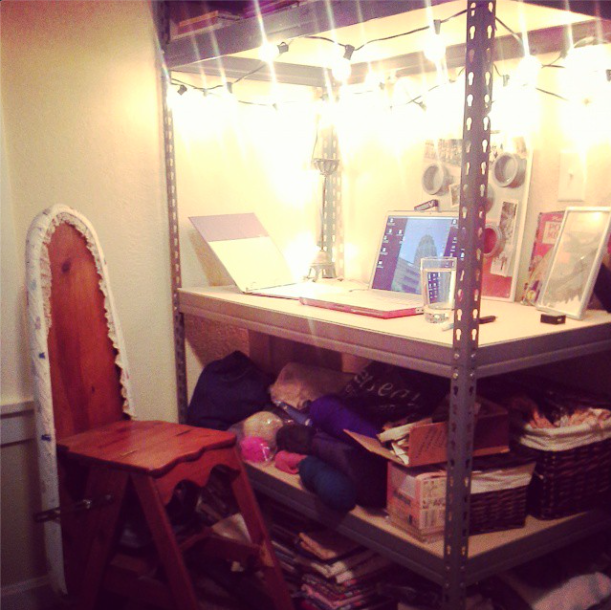 The ironing board is my chair, and that desk is actually adjustable shelving. And I'm obviously still figuring out how to organize my yarn. It's "make do" at its best, and I love it! Friends and progress. 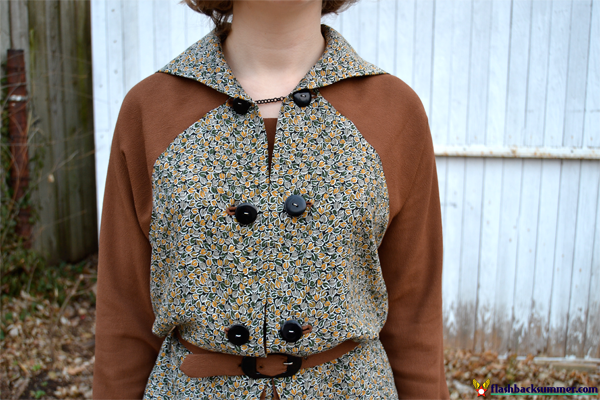 Needless to say, I get my vintage fix from the blogosphere, not real life. The online vintage community allows me to interact about vintage things that make the eyes of most people in "real life" glaze over. I hugely appreciate that about my online peeps! Progress is also hugely rewarding for me. I enjoy learning, and seeing my blog hit milestones and grow little by little is great. It's wonderful to see the fruits of all that labor! On the flip side of progress is the lack of progress, and that can be demotivating, too. When numbers aren't as high, or a post didn't get as much interaction as I swore it was going to. Working to come up with good, valuable content is a lot of work, too. I really love it though, so it's worth it! I've relished the ability to post more often and do higher quality posts now that I've graduated from uni. It's so much fun! 8. What is your lasting inspiration or motivation (of blogging)? Making money is nice, but I'm finding more and more that I'm motivated by my affection for the vintage community. I want to give you guys good content, because you so often give me good content! You guys have helped me learn about vintage through your posts, comments, pictures, etc., and I'd like to return the favor. Maybe there's another vintage newb out there than can benefit from what I've learned. 9. What is your blogging dirty secret? I'm RIDICULOUSLY strategic. Now that I have more time to blog, I'm hugely intentional about the content here and such. I'm talking editorial calendars, sticky notes, binge writing, the works. On a deeper note, though, I do sometimes have a rough time with comparison, as I mentioned before. I think it's a little easier to see someone else's progress and success than it is our own, though, at times. Our own progress comes with a price of work and effort that we don't see when we observe other people's success, so it looks more effortless with them when it's really probably not. 10. What is your current goal as a blogger? 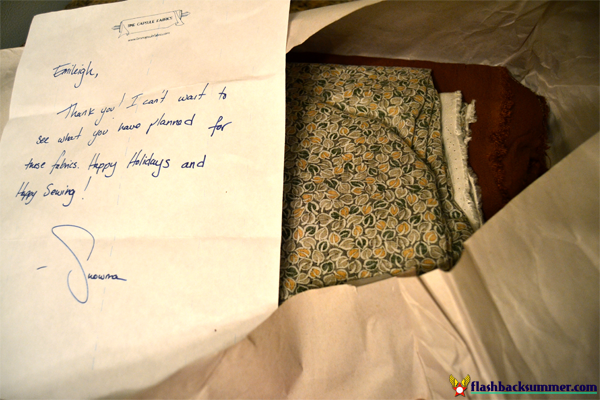 I'm actually working on more vintage- and sewing-related freelance writing in addition to my blog. I never thought I'd be a writer, but there are opportunities coming up, so I figure, what the heck. Might as well try! This can help grow my blog, too. 11. Have you learned or become passionate about anything through blogging that caught you by surprise? It sounds weird, but I'm actually passionate about blogging itself now, and I didn't think I would be. At the beginning, I figured blogging was just a means to an end, but over the years I've begun liking blogging itself. I like researching and sharing information, and I like interacting about it with you guys! There's a bit of insight about myself and my blogging journey. Feel free to reuse these questions and post about them yourself! 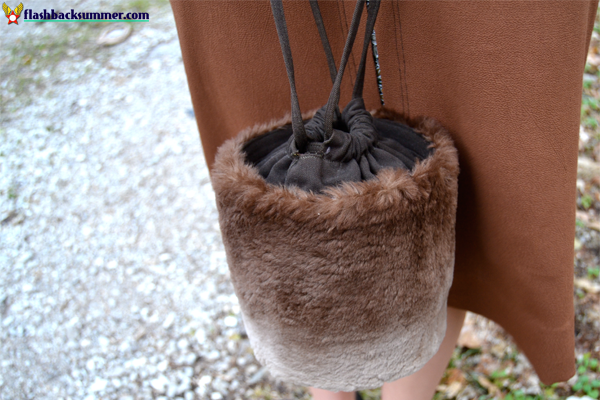 For more photos of the garment, you can go to this post. Link Buttons - It calls for three pairs of link buttons; I have a quick solution on these for you below in the "Things I Added" section! The fit on this pattern is strange. I sized down on the top (using a 30 bust pattern piece even though I'm 32"), and as you can see, I still have plenty of room. It's meant to be bloused, but I would still recommend sizing down. I imagine the top in my size would have been far too baggy, and I'm not sure if this is just the pattern or a normal 30s fit style. The bottom, however, was more narrow. I chose a 35" hip size pattern pieces (the middle of size pack A) due to how my muslin sewed up, but I think I could size down as well for a more snug fit. The fabric is not cut on the bias, so the skirt goes more or less straight down from the hips. If your fabric doesn't have any stretch though, like a cotton, I'd stay true to your hip measurement. Sleeve length - I shortened the sleeves to 26.25" from the top of the pattern piece to the bottom. I could probably take off another inch or two next time. My arms are " from shoulder to wrist. Skirt length - It was just too long! I shortened it to " this time, but I think I'd make the hem longer for a more 30s length next time. Waist - With the larger hip size pattern, I brought in the waist about 1.5", and it's perfect. I have a 24" waist. Peplum - I cut out the pieces, and it was a bit too long for my height and wide for the newly decreased waist, so I added a 1" hem on all sides, instead of the more narrow one called for. I eased it in on the waist. Hip apex - I'm short, and the hip apex on the skirt was about 2" too low for me, so I raised it, and the skirt piece fit perfectly after that! Maybe this stuff is assumed in the pattern, or maybe I did it a janky way, I don't know. Either way, you are now privy to it! The dress opens via hidden closures in the center, not at the side or back. I didn't realize that when I bought the pattern. I added snaps at the top and bottom of the vestee corners on the side the dress opens on. I figured it would be better to over-snap the closures than under-snap! I attempted to link the buttons on the bodice using thread and a blanket stitch as old methods would instruct, but it would have taken FAR too long and had too large a margin of error for me to continue on all the buttons. Instead, I inserted a jump ring through each button and connected the pairs with plain black necklace chain. The top pair is slightly closer together than the other two pairs to make it look right. It works just as well as the thread version, in my opinion! 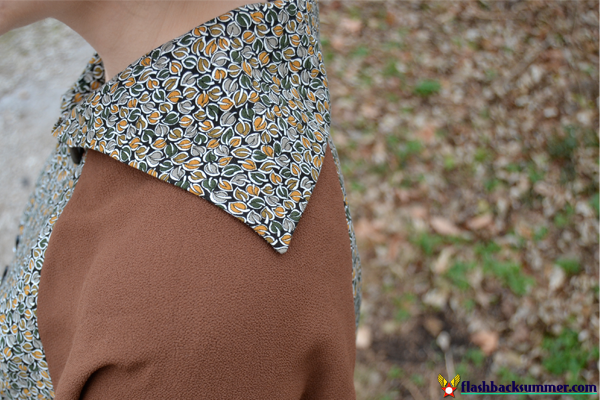 I also interfaced the top layer of the collar with thin interfacing to help it stay crisp. I'm very proud of the belt. While the belt buckle is not quite wide enough for the belting I used, it works fairly well. It's a vintage buckle, and I really had to make do with it. Is anyone else frustrated at the lack of belt notions available these days?! I sure am! I also put holes in this one, unlike the other belt I've made before, which just slipped through. I ended up using a scrapbooking grommet setter to poke holes in the fabric and belting, then I finished the holes with a hand-done blanket stitch. I've seen this on vintage belts, so I decided to try it out! It works out well, although a little labor intensive! I didn't adjust the waist size for the skirt when I cut it out, and I just brought it in at the sewing stage. I didn't bring it in the same way on the peplum, so it doesn't lay perfectly flat. In the future I'll adjust all bottom pieces to be smaller in the waist before cutting them out. I initially had the hem longer and shortened it to where it is now. 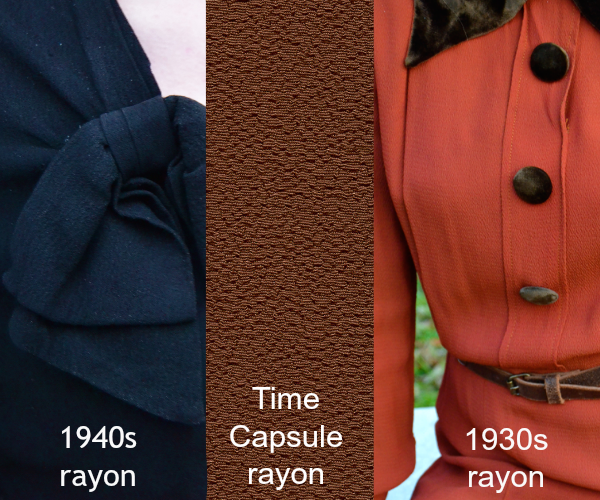 However, looking at it in the pictures, I think I will want it about 2" longer on the next round for a really good 1930s length, like my other 30s dress has. That length does a better job of elongating. My bound buttonholes need some help. 'Nuff said. I have the general idea right, but I found a Wearing History tutorial that will help me make them look more polished next time. Live and learn! This. Is. A. Fantastic. Pattern. The pieces fit together perfectly, and the instructions are thorough enough to understand (for an experienced sewer). The pattern comes in a large resealable bag to keep the pieces in, and it is printed on a heavy, durable paper that can easily be altered for fit while lasting for years to come. I also like the long and short sleeve options, and I'll be trying the short sleeve one come warmer weather! 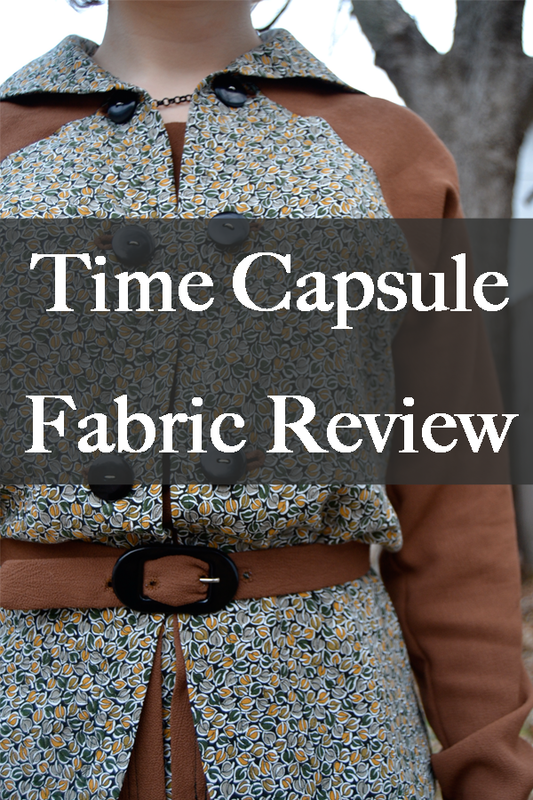 I've been pondering getting a few of the other Wearing History patterns, but many still have a lack of reviews and finished photos, so I was a bit nervous about it. 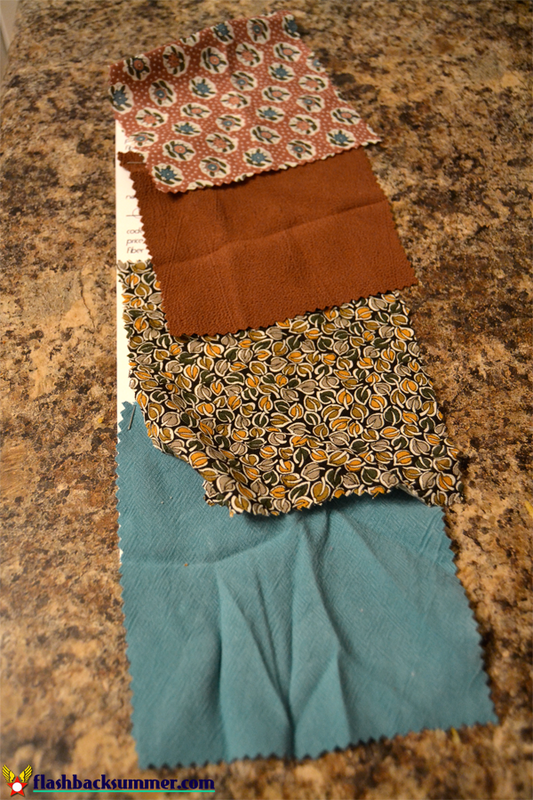 However, this pattern came together so nicely I'm confident the others will be good quality, too! 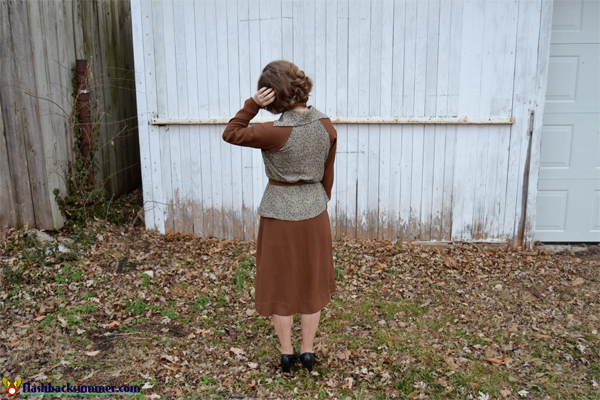 Pattern: Wearing History "Tea at Two Dress"
How historically accurate is it? Extremely! 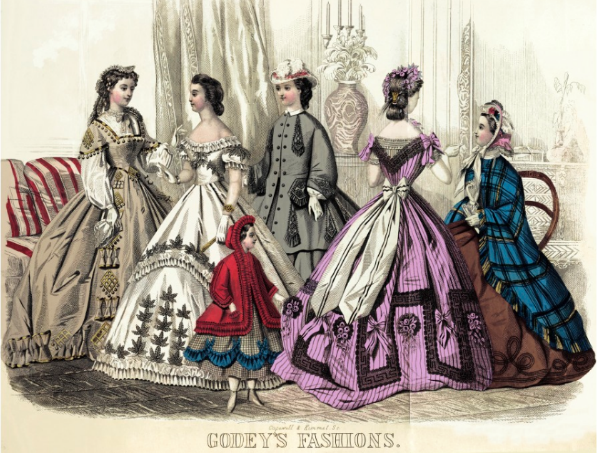 New-vintage pattern and fabric, vintage notions. Everything except the buttons, which are new. Any tricky parts to the pattern? 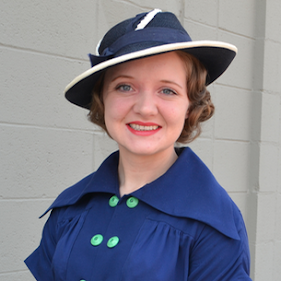 I talk about this more above, but the 30s-style construction techniques and closures are just different than the other decades I've sewn. Time to complete: a week solid. Lots of little details to work on! Total cost: Fabric was free to review, buckle $1, belting $2, buttons $2, necklace chain $2, pattern $30.60 with shipping, so about $38 total. Notes: I've gone into great detail above! This is a fantastic pattern! 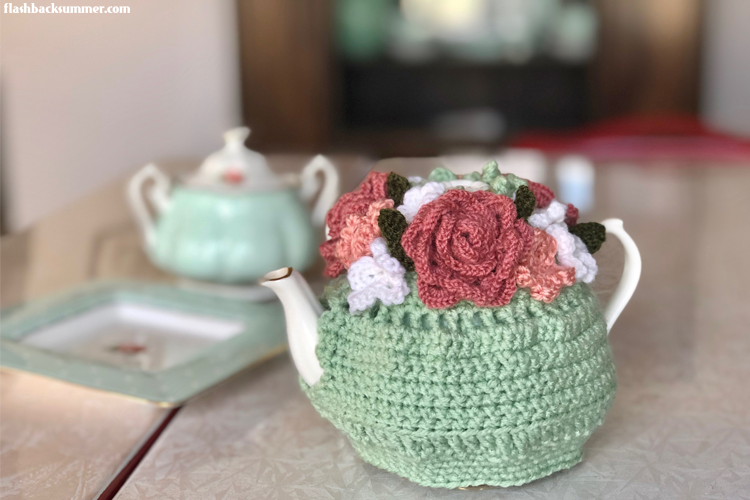 Have any of you tried out this pattern or know someone who has? Please add the link and lets help future sewers have a database of good info and pictures of this pattern! I'll be posting thorough details on the dress pattern in my next post, but for now, enjoy the pics taken in the dirt road/alley next to my house! 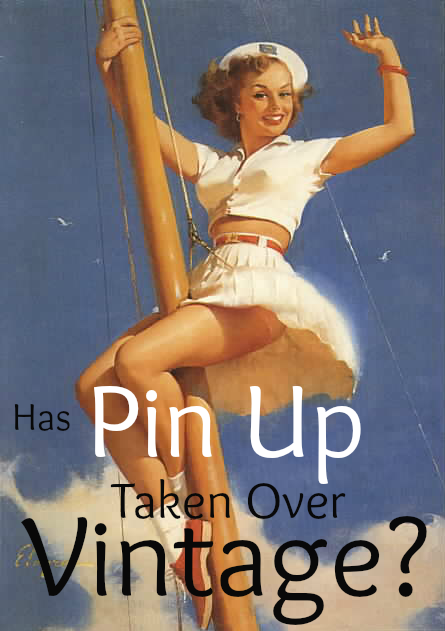 Controversial Post: Has Pin Up Taken Over Vintage? 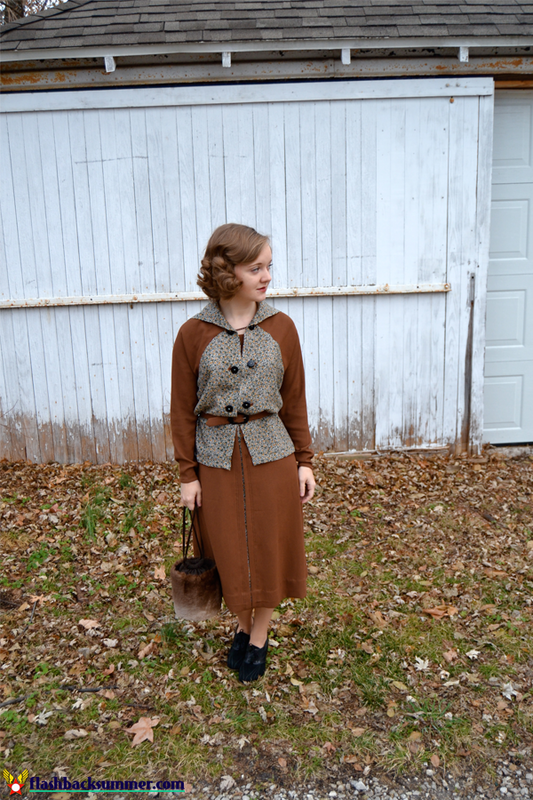 There is a myriad of ways people wear vintage clothing, but in my experience in the vintage community, people's wardrobes tend to fall into one of three very broad categories: authentic vintage, eclectic vintage, and pin up. 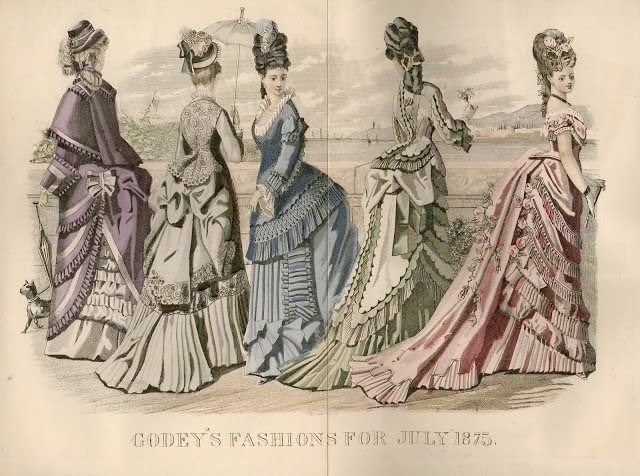 Authentic vintage would be the people that recreate period-accurate looks. The next one is eclectic vintage, or the people that mix lots of decades with modern styles for a look that is unique. 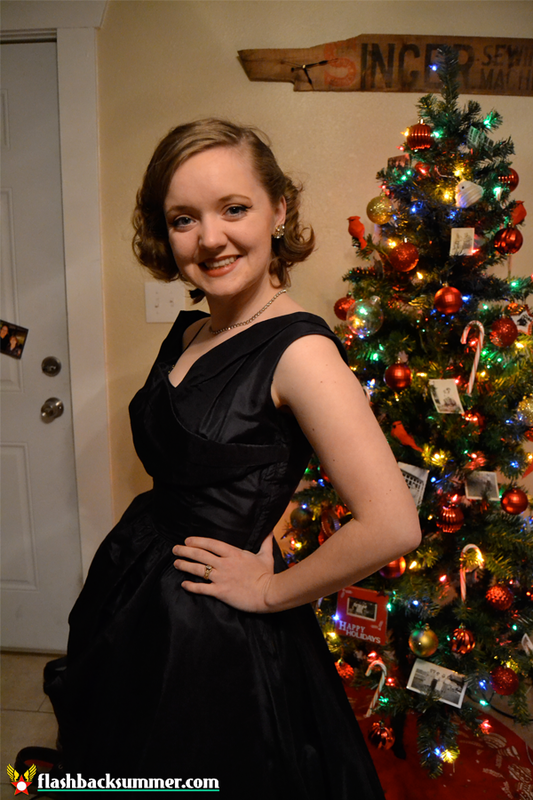 The last one is pin up, or the ladies that dress with a style like, well... a pin up. Pretty self explanatory. Personally, I'd probably put myself in the authentic category. 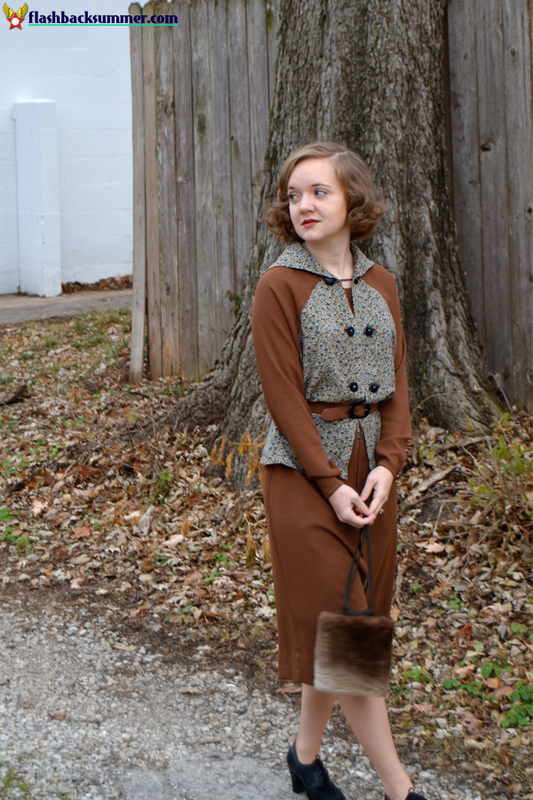 I like doing head to toe 30s and 40s looks, and I tend to get inspiration from more normal, everyday looks like the ones found in vintage photos. Also, one of the reasons I started wearing vintage was to get access to clothing that was more modest than what is offered in mall stores. I was tired of the stretchy-tight, short pieces I found at stores, tired of having to be vigilantly aware of the wind patterns while wearing a short dress. The longer hemlines and more coverage of vintage clothing helps me feel more comfortable, because I'm not afraid I will flash people and I don't have to wear layer upon layer to get the coverage I want. 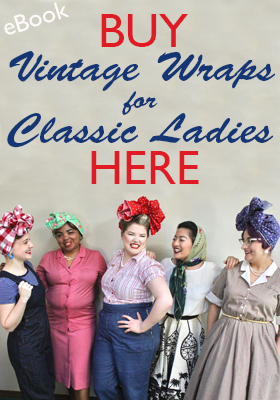 However, when a lot of people hear "vintage," they think "pin up." Tight wiggle dresses, giant hair, spike heels, va-voom curves. Of course, I like those things too and I definitely go for more "pin-uppy" looks from time to time, but I generally don't wear them on a daily basis. Of course there are authentic reproduction shops, and I don't want to minimize their products or influence. But it seems pin up style has taken over vintage in some ways, especially as representing the first half of the 20th century to non-vintage wearers. What do you think, does it seem like the pin up look has begun to represent "vintage" in the non-vintage world? What are your thoughts on that? Where would your style fit, or do you fit in more than one category? These tips are simple to do in only a few minutes! - Eat by candlelight or Christmas lights. - Sit at the table with each other. No phones, no TV. - Play instrumental music in the background. - Make a beverage for a "cocktail hour" or dessert to have after dinner. - Take time to have coffee or tea after your meal. - Eat with chopsticks (or forks, or your hands, whichever isn't your norm!). These ideas will take a little more effort and planning, but they are worth it! - Prepare a meal made entirely of pins from your significant other's Pinterest board. - Add a nice tablecloth and centerpiece to your dinner table. 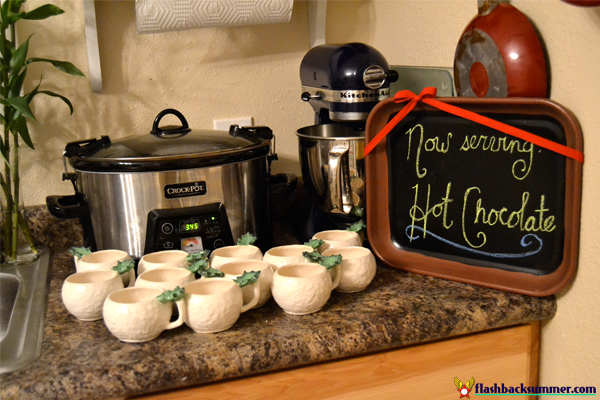 - Get out the fine china and use it for dinner. - Spread a blanket on the floor and have an inside picnic. - Try another culture's food together. 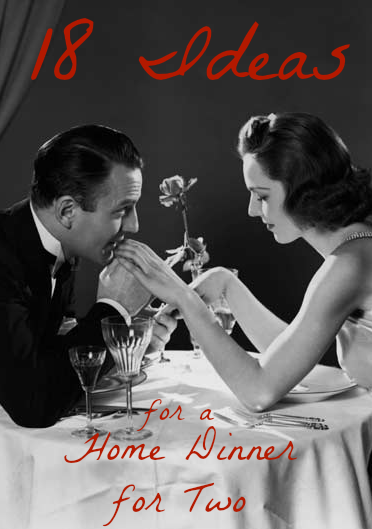 - Make a meal incorporating different milestones or memories in your relationship. Food from a special restaurant, or an umbrella in the drink to remember that fabulous trip, etc. These tips can take a lot of time and effort, but the results are memorable! 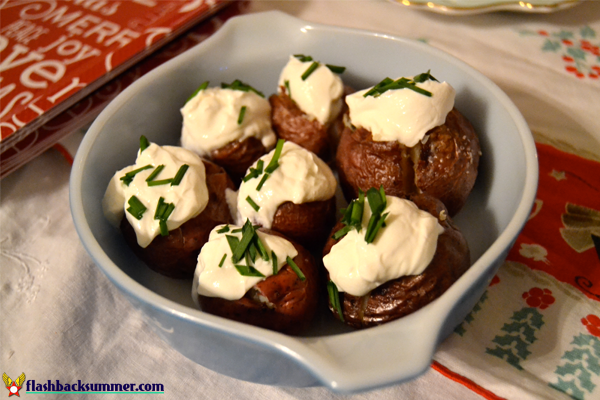 - Do a holiday meal, even if it isn't the right time of year! 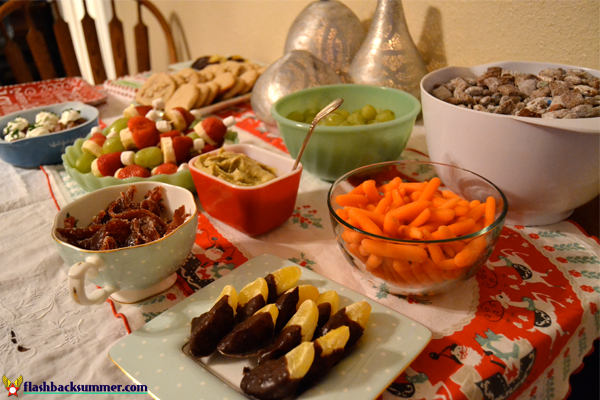 Decorate the table and have a mini Thanksgiving in March or Christmas in July meal. - Make a tent in a room of your home and light it with candles and Christmas lights. Throw in some pillows for comfort, and eat dinner in the fort! 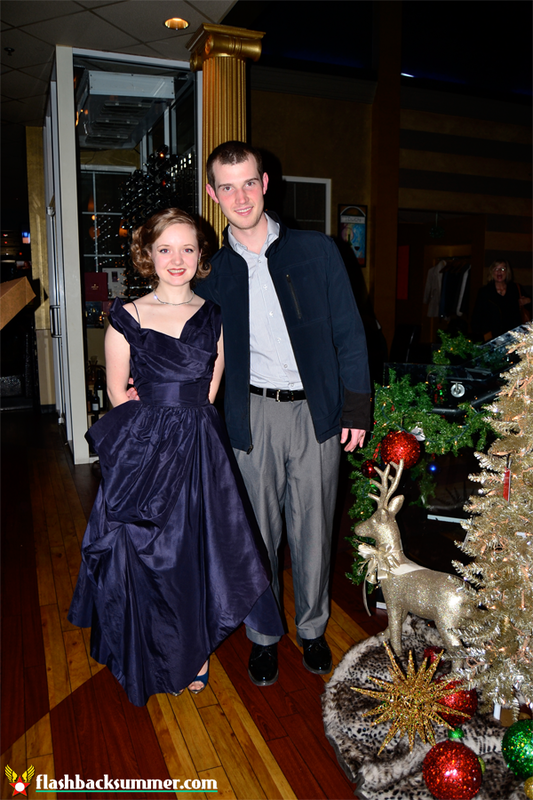 - Dress up and have a fancy dinner at home. Then move furniture around as necessary to make a dance floor. - Plan a new kind of meal you've never tried before and cook it together. - Make an entire dinner of things on skewers. Fruit, vegetables, meat kabobs, desserts, lots of options! To get extra fancy, make sauces to go with them. - Have a themed dinner. Whether it's based on a movie, story, or character that your significant other enjoys, go all out! Perhaps some Elvis PB and banana sandwiches, a hobbit second breakfast, a 1920s dinner in Cairo, or a Regency era-appropriate meal would be up your alley. For extra flair, dress up according to the theme.